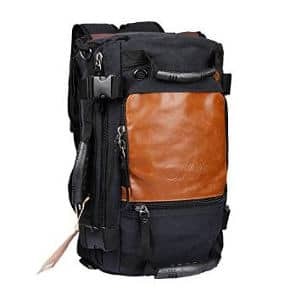 A travel backpack is one of the first things we should consider buying if we are traveling and it is important that we don’t buy the first thing we see or go for a cheap option in a hurry. If we don´t make a good choice, the backpack may turn out to be too big or too small and many necessary things will have to be left at home. We might also choose a low quality material which may break at the least expected moment during the trip. Therefore, it is essential to spend some time analyzing the options before buying our first backpack. Before talking about the characteristics of a good backpack, let’s talk about something very important which is weight distribution. A good backpack should be designed to transfer all the weight back towards the cervical spine and down to the legs.If it doesn´t do that, the backpack is useless and you may end up with a tired and sore back. Another important fact to remember is that the weight of the backpack should not exceed 25% of your body weight. For example, if you weigh 72 kilos, the loaded backpack should not exceed 18 kilos. This is one of the key points when choosing a backpack and one where we all have doubts. ¨Is it going to be too big? Is it too small?¨These are all typical questions we ask ourselves. The perfect size depends on what kind of trip you are going for. It´s not the same to travel around the world and climb the Everest or going to a country with warm climate for a few days. 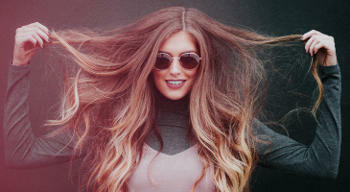 Therefore, it depends a lot on your preferences, but there are some general tips that can be followed. The first is that the backpack should be proportionate to your body. If your physique is small, no point in buying a huge backpack. My opinion is that a backpack of 50 liters is more than sufficient to go for a longer trip or 25 liters for shorter time trips. My personal choice is about 45 liters and you can pack a lot of stuff in that size. But I use that only if I go for a longer trip. You should also check with your airline about the measurements allowed. Although these are pretty standard, from my experience some airlines do change their rules, particularly in Europe. 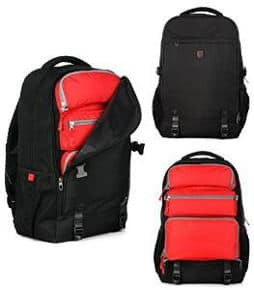 In addition to ensuring that the backpack distributes the weight well, you also have to look at certain characteristics that make the difference between a good and a below average quality backpack. Unless you are going to a desert, it is very likely that at some point you may get wet in the rain and you won´t want the things inside the backpack to get wet such as your clothes, camera, tablet, etc. So, one of the key points is that the backpack is waterproof or at least semi-waterproof. Waterproof backpacks are more expensive, so a cheaper option is a backpack that has a cover. This rain cover is stored in the lower part of the backpack and in case of rain, you can take it out and protect the backpack from rain. It is also necessary to be of a very good quality and durable so that it can last you for years. During your journey, it will get bashed about, stepped on, get wet etc. Therefore, it is very important to be made of some strong and resistant material. The backpack should allow access to your stuff both from above (as in all backpacks) as well as from below. Because imagine if you left your pants in the bottom of the pack. Are you going to get everything out to get the pants? Definitely not! If possible, try to get a backpack which has double locking on the pockets. So, if one breaks, you’ll have the other one as a “reserve”. By having double locking, you will be able to put a lock between them and block access to your backpack. It is essential that a good backpack has different compartments or pockets. That way, your luggage can be divided into smaller sections which will allow easier access to your stuff, without having to disassemble the pack every time. In the past, the backpacks used to come with an iron frame, which made them heavier and uncomfortable to carry. But today that ugly iron structure has been replaced by carbon fiber, giving the backpack better aesthetics and making it easier to carry. The belt is a fundamental part of the backpack since it is responsible for distributing the weight of your body and relieving stress on your spine and neck. Therefore, it is necessary that the belt is adjustable to adapt to your body, and it should also be padded so it doesn´t hurt. Moreover, the wider, the better, because that way it will apply less pressure on the shoulders. Another important element is the chest strap which should be well cushioned. If it´s well adjusted and padded, you will feel the weight redistributed, making it easier for you to walk. This part of the backpack remains in contact with your back and should also be padded for comfort and weight distribution. It is also important to have some sort of ventilation system, especially if you are in warm environments since you will not want to feel as if your back caught fire from the heat. Now, let´s have a look at some of the best backpacks on the market. They may not all have all the characteristics mentioned above but I will leave it to you to pick what is most suitable for you. 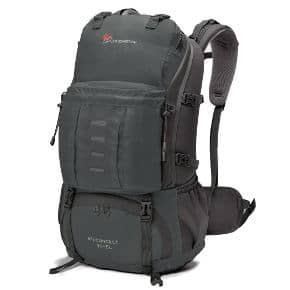 In this review, I have selected the best possible travel backpacks available for men and women, and tried to keep the selection within a reasonable budget. 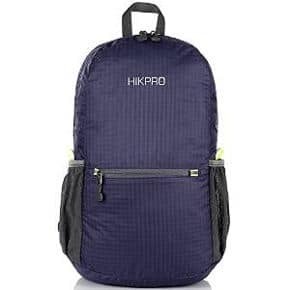 This Ultra Lightweight Packable Backpack for Men and Women is available is 8 colors and gets fantastic reviews. The price is a big plus coupled with the quality, no wonder why so many people are buying this product. 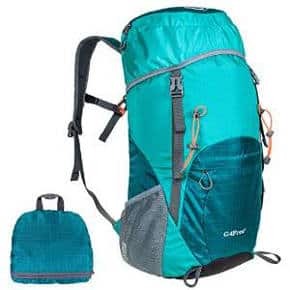 It is suitable for men and women and can also be used as a hiking backpack. It is a 20 liter backpack, not appropriate for long holidays but good for shorter breaks and for camping etc. This backpack folds easily into a small area without taking much space. The straps are wide and comfortable made with breathable mesh. 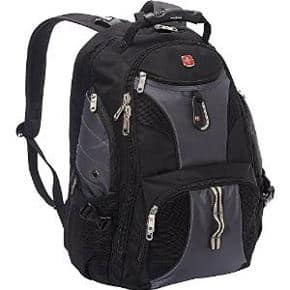 It has various compartments and pockets to carry both your large and small items and finally the company offers you a 30 day full money back guarantee if you are not happy with it. 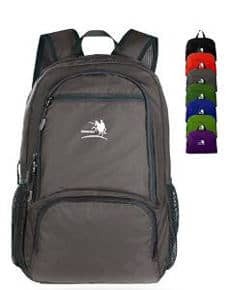 The Free Knight Lightweight Travel Backpack is available in 8 attractive colors and this is another product with an extremely economical price. It is very lightweight weighing 0.56 Pounds and the capacity is 25 liters. It is also compact enough to fold and fit anywhere. It has different compartments and zipper pockets to store smaller accessories safely and a main roomy compartment for bigger items. It is made with water resistant nylon fabric and provides strength and long-lasting use. Stress points are reinforced with bar tacking. It gets excellent reviews by the users who say it´s ideal for shorter trips as well as a great gift for men or women. In addition, users say that it is surprisingly spacious and good for traveling since it fits under an airline seat. This Packable Handy Lightweight Travel Backpack is available in 9 colors and gets thousands of positive reviews. A huge majority of users love it and have bought more than one for various tasks. It conveniently folds into an inner pocket and you can fit it in a small place, making it a true space saver. It is water resistant and extra stitching is done at stress points to give it strength and long lasting performance. 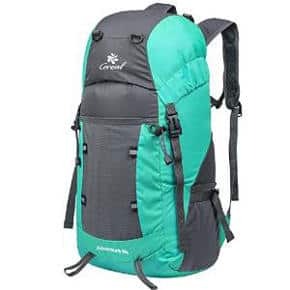 One more important feature is that it is extremely lightweight (0.5 Pounds) and the capacity is 33 Liters which is large enough to take your things if you are traveling, hiking or going on camping trips. The company offers a lifetime warranty or exchange/return. 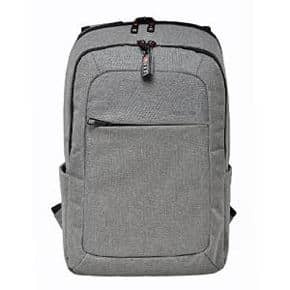 This SwissGear Travel ScanSmart Backpack is a real stylish looking quality product. 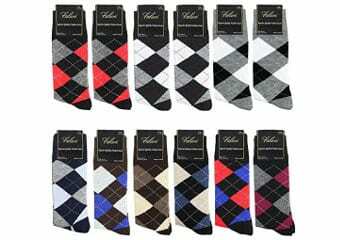 You can either go for a solid black or a black with blue gray or red colors.The reviews are in thousands and ratings of this product could not be better. It´s a compact little bag and you can´t really use it for longer trips but it is suitable for weekend breaks or carrying books, your laptop etc. The dimensions are 8.5 x 18.5 x 13.5 inches. It comes with multiple organizer pockets and an audio interface, and you can fit a laptop of 17 inches in it. The shoulder straps are very comfortable to carry. Users say that this is a high quality product, the material is very durable and the zippers are huge and strong. 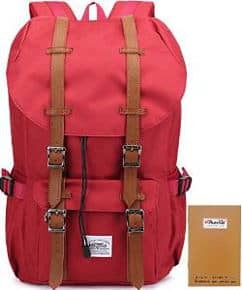 Overall, a real classy product and SwissGear are known for their quality. The Coreal Large Lightweight Travel Backpack is a travel as well as a hiking backpack. The capacity is 35 liters giving you ample space for your traveling needs. It is available in 9 colors with some of them being very nice. The size is 21.56″ x 11″ x 7.87″ and the folded size is 9″ x 7″ and even with 35 liters of space, it only weighs 0.77lb. The company claims that it´s roomy enough for your hammock, clothes, towel, journal and a couple of beers if need be. It is made from highly rip and water resistant nylon fabric which strengthens the backpack and gives you a long lasting use with minimal weight. It is perfect for hiking, occasional travelling and camping. Overall, it´sa good suitcase alternative and can make a great gift. This Cabin Max Metz Flight Approved Backpack comes in some very attractive patterns and lots of colors, and I seriously mean a lot, you´ve got to see it to believe it. It is designed to fit the maximum size allowed on a IATA flight 55x40x20cm and has a massive capacity of 44 liters. It can be taken easily as hand baggage without checking it in. This is a shower-proof nylon bag that has a padded back to make it comfortable to carry. It contains 3 main zipped compartments and 2 zipped internal compartments. The shoulder straps and side straps are adjustable. In addition, it is large enough for you to go on a trip for almost a month. It´s worthwhile mentioning here that one of the users listed all the things he took for 28 days holiday and it´s really massive amount of clothes. The Kopack Slim Business Travel Backpack is not suitable for a longer period of traveling as it´s quite compact, but it is perfect for day round trips on business. I wanted to include this in my review as it´s a really good quality classy looking backpack. If you go out a lot for business trips for a day and need something little bigger than a laptop case, then this is perfect. The price is excellent for what you get in terms of finishing and quality. 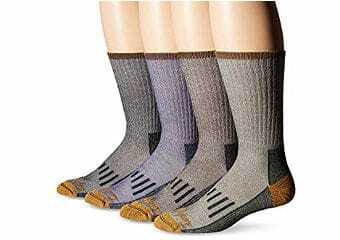 It is only available in gray color with black trimmings which gives it a smart look. The dimensions are 11.8″ x 7.1″ x 17.7″ and the capacity is 23 liters. It is water repellent but not waterproof and made with tear-resistant durable nylon fabric. The dual access zipper allows for an easy access. The bag is divided into one large packing compartment, separate laptop compartment, tablet holder, and front pocket organizer. Padded shoulder straps and back padding give you an extra back support and comfort. Users give it very high ratings and state that it´s a great value for the money. The OXA Vintage Canvas Travel Backpack is made with 90% high density cotton canvas and 10% PU leather. The canvas makes it very strong, giving you a long lasting use. The bag is strong enough to carry extra load if you are traveling. The structure consists of 1 main zipped pocket, 2 front zipped pockets and 1 side mesh pocket. It can hold up to 30 liters. The approx size is 12″ l x 18″ h x 7″ w.
This is really a multi-purpose bag which can be used as a brief case, backpack, laptop bag or a cross body bag. It has a shoulder strap which you can detach and carry it with two handles. The shoulder straps are wide and soft with plenty of padding to avoid any stress on your shoulder. This Lightweight Water Resistant Travel Backpack is quite large with a capacity of 40 liters. It´s big enough to carry all your stuff comfortably for a trip to last long period. It is very lightweight and can easily be folded into a small pouch. 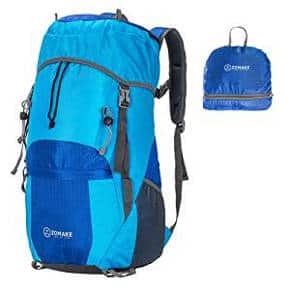 This travel or hiking backpack is made from a high quality water and tear resistant nylon fabric. It is available in 7 colors with some of them being very bright and eye catching. I personally prefer the darker colors but some people would love the rest of the colors it offers. The size is 22.8 x 13.4 x 7.8 inches and folds into 9.4x 7.8 x 3.9 inches. The different compartments of the bag are: 1 Main Compartment, 2 Top Pouch (Interior & Exterior), 1 Front Spandex Pouch, 2 Sports Bottle Holder, and Padded Backpack Strap with Chest Clip. This product is perfect for hiking, occasional travelling and day-to-day use. 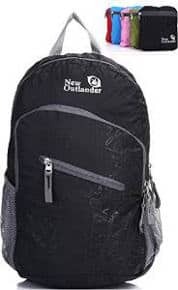 The Outlander Lightweight Travel Backpack is a large 35 liter travel or hiking backpack that is available in many colors to suit both men and women making it a very economical unisex backpack. It comes with numerous compartments, a roomy main compartment, two front zipper pockets to hold small accessories, and two side pockets for your water bottle or umbrella. This is a compact bag that can be folded into a zippered inner pocket and weighs only 0.7 Pounds. It gets a huge number of reviews with users giving it extremely high ratings, clearly making it a well liked and popular backpack among the customers. As the users state, the space is ample to carry an incredible amount of stuff, with some of them giving a never ending list of things they carry in it. 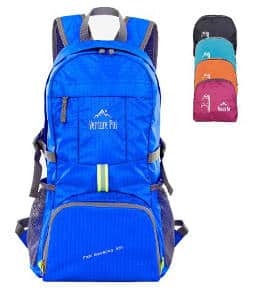 The Venture Pal Lightweight Packable Travel Backpack has lot of nice features with durability being the most important one. 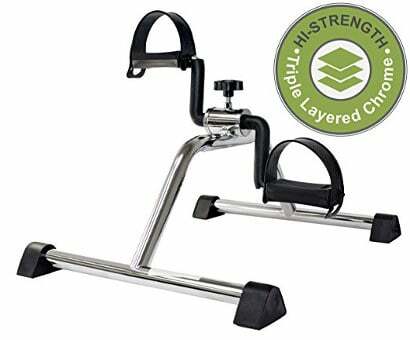 Made with high quality tear and water resistant material, this product provides extra strength and long-lasting performance with the lightest weight possible. It has a double layer at the bottom so you can freely carry extra weight on your journeys if you need to. The shoulder straps are well padded with breathable mesh while the chest strap with a whistle buckle help you lock your backpack in place securely. This backpack features one main zipped compartment, two zipped front pockets and two side pockets. They have also given two separators in the main compartment to further organize things. The two front pockets are good for holding small accessories and in addition there are two side pockets for other little items. This product attracts very high ratings by the users and the company offers a lifetime warranty, exchange or return, as you prefer. 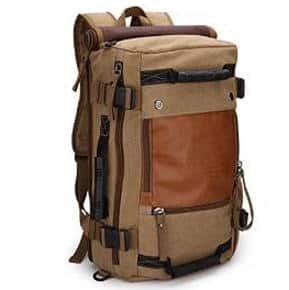 The Ibagbar Canvas Travel Backpack is available in one very attractive color (I love the khaki color) and is made of 90% high density cotton canvas and 10% PU Leather. The canvas component makes it long-lasting. The bag consists of 1 Main zip pocket, 2 front zip pockets, 1 side mesh pocket and of course a shoulder strap. 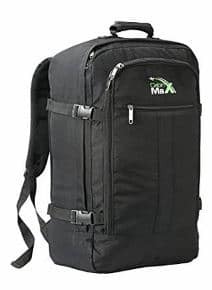 This is a 30 liter backpack and the dimensions are 12″L x 18″H x 7″ W.
It also offers you three ways of carrying, so it´s very versatile in its uses. You can use it as a backpack/rucksack/satchel/crossbody bag/shoulder bag. The company offer a 1 year warranty and ask you to contact them about any problem. Overall, this is a highly recommended product which can be of multi-purpose use. The quality is very good and it will last you for a long time. This Kaukko Outdoor Travel Backpack for Men and Women is a high quality product that comes in 10 attractive colors to suit men and women. It is made of water repellent nylon and high quality faux leather which gives it a great finish. The size of the bag is L11.8*H18.5*W6.3 inches and has a capacity of 22.4 liters. It features a drawstring closure at the main compartment and red stripes cotton lining. The pockets in the bag consist of 1 main compartment,2 inside pockets, 1 outside zipper pocket and 2 side pockets. Users state that they really like this backpack. It has ample space inside with multiple compartments to keep your things organized and they also find that it´s a great buy at that price. This Multifunctional Unisex Luggage & Travel Backpack is available in two sizes and 5 colors. The bigger size is a little higher in price for obvious reasons. 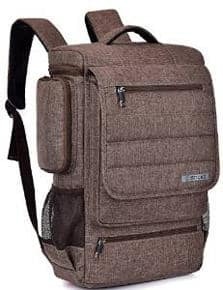 This product is not suitable if you are traveling for a longer period but it´s perfect for a day round trip or to carry your laptop and other small items. It can take up to 17 inches laptops. The bag looks very stylish and fashionable and is suitable for both young and older people. The strap is well padded, which makes it convenient to carry, while the mesh pocket gives it a nice touch of style. The dimensions are 17.72 inches x 11.02 inches x 5.71 inches. It also features a large storage area to keep your accessories organized and a discreet back pocket to keep your valuables hidden. 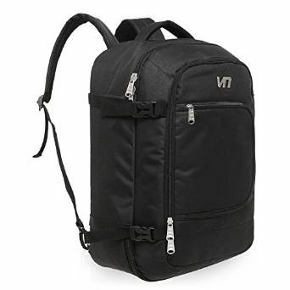 The Venture Packable Travel Backpack is a very economically priced bag that gets great reviews by the users. It is available in 5 stunning colors. This is a medium size backpack with a capacity of 20 liters and weighs only 0.5lb. It features one main zipped compartment, two zipped front pockets and two side pockets. There is enough room in the main compartment to carry things if you are going away for a day or a week. You can also organize your smaller things in the two separators and there is a small pouch in the main compartment. You also get two side pockets with adjustable buckles. It is made with high quality tear and water resistant material and has a double layer bottom. The two way SBS metal zippers is another handy feature. Mesh shoulder straps have sponge padding for you to carry it comfortably. 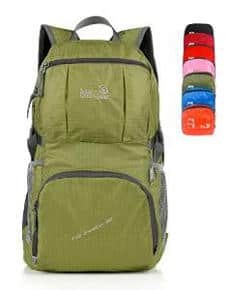 This Mardingtop NEW Backpack with Rain Cover is a large heavy duty backpack which can be taken for very long trips since there is no shortage of space in this bag but is also perfect for hiking trips. This is certainly not a low price item but has some great features and quality. The front pocket has a strong zip to carry various items like tools, camera etc. The pocket can be stretched to store your jacket etc. There is also a zippered bottom section as well as side mesh pockets to hold smaller objects. It has 8 adjustable straps and both sides of the shoulder straps have a D-shape hook in which small items can be hooked. Another useful feature is the hip belt which helps to support the pack and distribute the weight of its contents across the body more evenly. A breathable back panel helps in circulating air along your back and the back panel is also heavily padded for comfort. 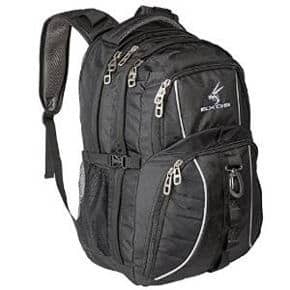 The Hynes Eagle Flight Approved Carry on Backpack is only available in black and has a capacity of 40 liters. It is made with polyester and PVC which makes it quite strong and the inner lining is of polyester. There are multiple side buckle straps to adjust the height to suit your preferences and you can convert it to a duffel from a backpack in seconds. 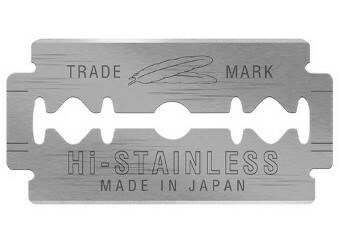 The dimensions are 20.1*13.4*9.8 inches and approved by IATA flights. 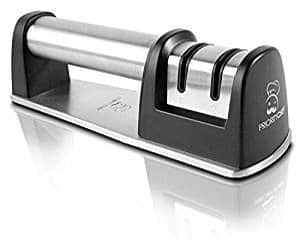 It also gives you 3 types of carrying options,and the top handle is quite thick and well padded to carry heavy weight. During your journey, it will easily fit under the seat as well as overhead. The Witzman Military Travel Backpack is a great product available in nylon or canvas with a very small price difference. The available color is only black. It can be carried in three ways as atote bag, shoulder bag/backpack or duffel bag. The size is 21″X13.5″X8″. It has a main compartment, 2 front pockets and one top pocket. The main compartment is big enough to store 4/5 days of clothing. This bag gets fantastic reviews and although there are not many of them, those people who bought the product are very happy with its quality and like it overall. 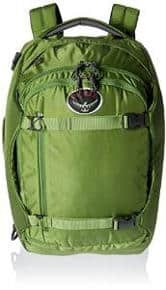 The Osprey Porter Travel Backpack is a higher priced bag available in green, red and black. It gets some glowing reviews with many happy users. It maybe a little expensive but the quality speaks for itself. Once you see it, you are sure to be impressed by what it offers. It is made using nylon fabric and the pockets are: 8 interior slip, 3 interior zip, 4 exterior, 3 card slots. It has Semi-rigid side walls and gives a rip-resistant in appearance. Users like the fact that it has a number of organizing pockets. The ZOMAKE Lightweight Water Resistant Travel Backpack comes in 10 colors and is well priced for a 40 liter backpack, especially considering the fact that it gets reviews with very high ratings from happy users. This is a high capacity bag, big enough to carry lots of clothing to go on a journey. The main compartment has a divider to separate your stuff. In this compartment, there is another double sided pouch for more storage. It comes with a pouch so when you are not using it, it can be neatly folded into this pouch and it can be then carried like a small handheld carry bag. At the back of the backpack there is a pouch where you can keep bigger items and will give you an easy access to take them out. The strap is padded so it be carried comfortable and it also has a chest clip if you want to tighten the bag against your body. The Top Power Convertible Carry-on Travel Backpack is an attractive looking bag. It comes in 6 colors which all look quite nice. It is also ideal for the organizational purpose, giving you lots of pockets to store various personal items. It is easy to carry with its padded straps and the airflow back panel helps prevent the heat on your back. 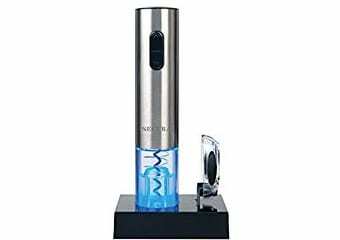 It has a capacity of 22 liters and an expanded capacity of 35 liters. The dimensions are 18*13*6 inches and 20*14*7.8 inches. 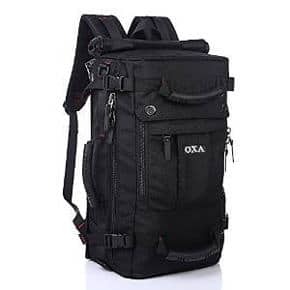 This OXA Travel Duffel Backpack Daypack is a large backpack with a capacity of 40 liters. It comes in black color only. This is a lightweight backpack made with durable terylene oxford fabric. The dimensions are 13″ L x 22″ H x 8″ W.
The structure of the bag consists of 10 pockets. 1 main zipped pocket, 2 small pockets in the main pocket, 2 front zipped pockets, 1 side mesh pocket, 1 laptop sleeve and 3 pockets in the large front zip pocket. It has wide and padded shoulder straps for your comfort and the chest belts can be adjusted between the two shoulder straps for better stability. The company offers lifetime warranty – exchange or return. This Backpack (laptop, travel, or business) Urban Commuter by EXOS comes in various two tone colors. This is a mid size bag with a capacity of 29 liters. Perhaps it is not suitable for longer trips but is ideal for day round trips or as a computer bag. The compartment is fully padded with easy access to your things. It has a multi pocket organizer with detachable key fob, zippered glasses or phone pocket with soft lining. Each side of the backpack has a 7″ deep mesh bottle pocket with elastic opening to securely hold a standard water bottle or a compact umbrella. 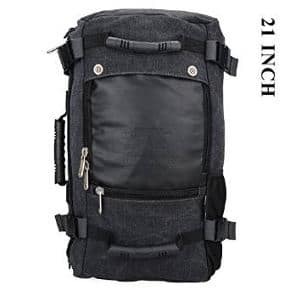 The reviews for this product are excellent with people saying that they really like this backpack and its tons of pockets. Some think it should last them for years. 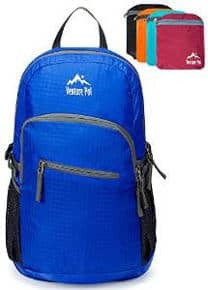 While it is not always easy to pick up the best travel backpack for men and women, the above guide and item selection will help you focus on those key points that are essential if you want to find a highly functional, useful and strong backpack to last you long and be an excellent value for your money.